Raised from the ranks of the Imperial Guard, the Young Guard contains the creme de la creme of the new recruits. They inspire surrounding units, encouraging them to fight on in the hope of one day joining the Guard themselves. Unfailing discipline means these men have excellent accuracy and their reload times are exceptionally good. These skills make them an expensive unit. Their only real vulnerabilities are artillery fire and sniping from skirmishers. 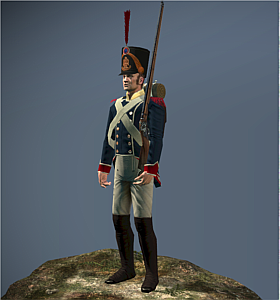 Historically, the Young Guard attracted a number of ambitious young soldiers looking to make a name in battle. One such gentleman was Adolphe Edouard Casimir Joseph Mortier, who joined the army in 1791 as a sub-lieutenant. He took part in a number of key battles during the Revolutionary War, leading Napoleon to place his name high on his first list of Marshals in 1804. Mortimer was a huge man, greatly respected by his troops, a fact that proved vital during battles in the Peninsular War, but helped him little at Waterloo when he was unable to join the battle due to severe sciatica. He eventually met his end in 1835 when he and eleven other men were killed by a bomb that was intended for the restored King Louis-Philippe.